If you decide to stay in your home during a storm, don?t subject yourself to cave-like conditions. Being totally isolated within the walls of your house with shutters rattling, winds howling and debris crashing can be absolutely nerve racking. Not having the ability to see what is happening outside your home can cause result in a claustrophobic reaction. Not a problem with our screens! We thermally bond re-enforcements to both sides of the screen. This re-enforcement eliminates fraying of edges. This fraying will occur even with heat-cut edges when the wind buffets the screen during a wind event. 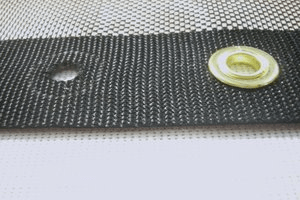 The thick re-enforcement allows grommets to be set perfectly, eliminating tear out conditions that occur in other products. Because this edging is heat sealed and not sewn, it does not experience the puckering of weathered polyester thread; this allows EzMax to hold it size true, year after year. 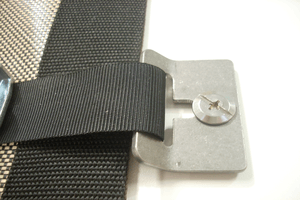 Our buckles are test rated at 1800 lbs. The buckles use a mechanical locking system. As the load increases, the buckles grab harder; this eliminates the slippage problem plastic buckles face. 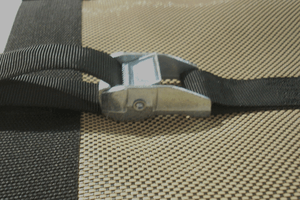 Plastic buckles rely on friction alone, and their holding power is greatly reduced when wet. Our buckles are made from zinc, a material stronger than aluminum and known for its rust-proofing properties. 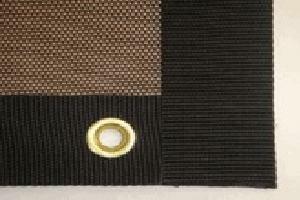 Our Re-enforced webbing creates an extremely thick material to insert our grommets. This thickness and our extra long grommets minimizes grommet pull out that many of our competitors experience. Because the edging is thermally welded EzMax does not fray or unravel inside the cut hole like some folded edge products. EzMax brackets are made from 1/8 inch stainless steel. EzMax brackets will slide on and off without removing the screw. This allows the product to be deployed quickly and removed quickly. They are designed to place an even load during positive and negative winds. This even loading reduces the damage caused by anchors pulling from the wall. Some products attachments use eyebolts that extend from the wall; this causes a lever action increasing the amount of pressure placed on the anchor exponentially. We sew our straps and buckles with Tenara thread. This thread made by Gore industries is made from the same material as teflon. It does not break down from chemicals, moisture, and sunlight. The thread is warrantied to last longer than any material that is sewn to. In 3 years it will not lose any strength at all, while the best ultraviolet ray inhibited polester thread will lose up to 70% of it’s strength. Because it is fourteen times more expensive than other threads, most of the competition does not use it. Call Weather Tite Windows for a free in-home consultation regarding hurricane protection for your home or business. Weather Tite Windows also offers other forms of hurricane protection including, corrugated aluminum and corrugated vinyl panels, roll down shutters, and many other options. Additionally, you can click here to view EZ Max Website for more information on the product.